On August 31, as part of the Red Lacre meeting held in Santiago, Chile, 15 delegates visited waste pickers in the Los Molles landfill in the city of Valparaíso, only a few days before its closure and the opening of a new one. The purpose of the visit was to show support and give motivation for local organizing and reintegration at the new landfill. 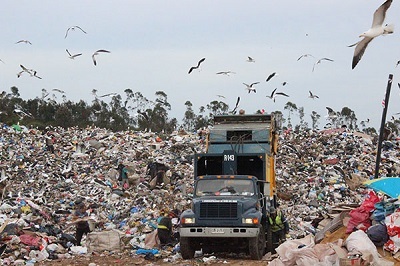 The landfill has been open for more than 30 years. 100 waste pickers worked at Los Molles. The process of closure at Los Molles allows the majority of the full-time waste pickers there to continue working, with restrictions on hours, until the end of the year. Concerned with the loss of livelihood for the waste pickers, the Movimiento Nacional de Recicladores de Chile, began supporting, together with the Fundación Casa de la Paz and a private recycling company, a capacity-building process for 67 waste pickers of Los Molles. This idea is that the group will transform into a cooperative. David Narváez, of Red Lacre and REDNICA (the Nicaraguan network of waste pickers), said that the waste pickers of Los Molles can count on Red Lacre’s support.